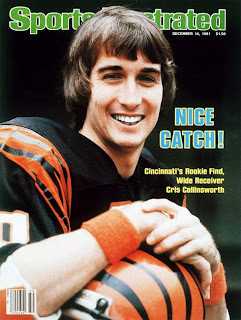 For years, I've been telling anyone who would listen that Cris Collinsworth is football's best analyst on any level. This is a huge upgrade for the Peacock and for NFL fans around the globe. Nothing against John Madden the broadcaster, he had a lot to do with the definition of the color analyst position. When he called the Super Bowl that involved Cris Collinsworth with the Cincinnati Bengals, Madden was the standard. But that was in 1982. My professional opinion of Madden is skewed by a preseason game I worked with him in 1995. I saw a man treat a number of people on the crew (including myself) as sub-human. There are plenty of network production types who have greater horror stories than the stat guy (me) who got his first note dismissively swatted back at him. As a viewer, in recent years, I can't recall anything memorable that Madden said. He became a caricature of himself, with the power of his name being far greater than any substantive points he made. His constant telestrations over moving video during the last Super Bowl made me cringe. He's 73. It was time. Collinsworth combines everything you want in your analyst. He's got a feel for the big picture, and describes things simply, but will give you skinny on the Xs & Os when needed. He'll engage in pointed criticism, a place where a number of ex-players won't go. And he doesn't do it just for effect. He's funny. And he's worldly. He can give you 20 neat seconds on the US Open tennis final or the MLB postseason during an NFL game and you won't feel that he's all over the place. As a radio host, a studio host, and a studio analyst, he knows the ins and outs of a broadcast infrastructure. When to punch points, when to follow up, and when to shut up. Collinsworth jumped from the top show at FOX when NBC got back into the football business, even though Madden was in place. His patience and team play has paid off. With apologies to my good friends Ed Cunningham, Andre Ware, and David Norrie, this guy is the best. Sunday Night Football will now, once again, bump HBO from my Sunday priority viewing.